Boarding | Welcome to Matthews Kennels! A minimum of 4 trips a day in one of our spacious grass exercise yards. Lots of exercise fun, pools in the summer and mountains of snow in the winter with ball & frisbee year round! All exercise yards outside perimeter fence lines are kept cleared (snow blown) during the winter months to ensure our 6 ft fence stays 6 ft no matter how much snow winter throws at us. 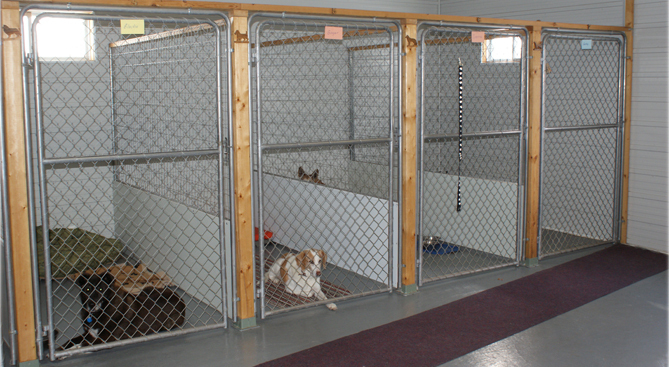 A climate controlled facility to keep your pampered pet warm in the winter and cool in the summer. Our facility has its own dedicated backup generator in the event of a power outage. A choice of beds. Kuranda orthopaedic beds for the canine who loves their creature comforts. The bed we recommend. However for the pet that is not allowed on furniture or has physical disabilities we also have a poly resin deck bed which resembles a deck surface but still keeps your pet comfortably off the floor. Vinyl covered custom mattresses are available for elderly or physically challenged dogs that use the poly resin deck bed. Area carpets available for floor surfaces for senior or sensitive boarders. Minimal number of caregivers for your canine friend. What does this mean? It means that the caregiver gets to know your pet so they notice behavioural changes, if they are eating & drinking well or had their medications on time. They develop a personal rapport with your pet. A variety of treats are offered four times, ok maybe five (Mother Hubbard, Dehydrated Liver, Medi-cal and a variety of grain free treats, sometimes homemade). Of course if your pet suffers from a sensitive tummy you are welcome to bring what they can have. Administering supplied medications and supplements. Laundering for soiled items as long as they are machine washable. Plasma HD TV with Shaw Cable for their viewing pleasure. Sonos sound system streams music during the afternoon and relaxing music at night. Security monitored facility for perimeter, smoke detectors, motions and temperature sensors. Multiple HD cameras to ensure that your pet is settling in well. All the hugs, snuggles, skretches, tummy rubs and pats your furry friend can handle.